Widespread bathroom sink faucet retrofit kits do not fit on older-style handle escutcheons. 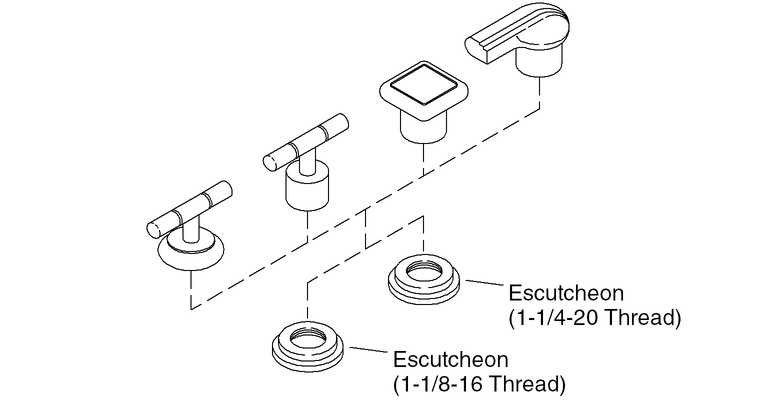 Owners of pre-1992 widespread bathroom sink faucets who purchase a new retrofit kit may also need to purchase a new escutcheon or handle kit if the handle escutcheon slides over the threads instead of threading on. Handles for these products were standardized in 1992 to change the thread dimension from 1-1/4" to 1-1/8". The retrofit kits are designed to fit the newer style handle escutcheons with the standardized threads. Order the correct service parts online, or contact the Customer Care Center for assistance.